How to challenge the “status quo”? breaking down the silos!a short guide on: how to practice bravery and develop a collaborative communication approach. For those of you who thought this blog is about the famous British band “Status Quo” that was founded in 1962 – I will have to disappoint you. For one, I am far from being a music expert - unfortunately, and secondly, I was only born 10 years after they launched their first record. No, this blog is about a topic I am more experienced in: It is about challenging the “status quo” and taking action when it comes to communication and collaboration in your organisation. Hence, I want to share with you a simple “cheat sheet” and communication cluster model. These two hands-on tools are designed for you to try-out. Experience has shown that applying this integrated approach has helped people achieve their team goals more effectively and ultimately resulted in breaking down the repeatedly mentioned silos that still occur in most organisations. Every idea or project requires a solid communication strategy with collaboration at the heart of it – AND obviously a well thought through tactical plan! Hence, ONE integrated strategy to achieve the goal. 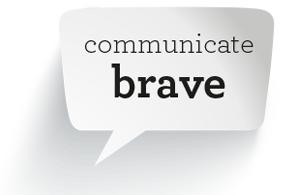 Having spent most of my career in large corporations, and consulting clients across different industries – I have learnt that there are “brave” and less “brave” communicators out there – at every level in the organisation by the way. Fortunately, most people I have come across are natural and compassionate communicators and they can genuinely rally people around an idea. But, many times I have seen them also struggle with the ability to successfully implement their idea. So the question that arises is: How to communicate effectively and get colleagues to collaborate purposefully? Now, we all are experiencing that the world has become more complex. Each of us is overloaded with information and we are often confronted with different communication channels which are “on 24 hours”. Hence, solving today’s communication challenges within organisations – in my mind calls for creative and most of all brave actions. It goes without saying that you should be brave AND sensitive at the same time. 1. Start with asking questions. Listen carefully, learn and try to get the feel for what it is like to work at the company you’ve chosen to be part of. Your personal and team communications success will depend on how well you can listen. Simply ask people how they get things done. This step is very important as you will learn a lot about formal as well as the informal ways of working. The ability to understand the “status quo” will help you influence the future! 2. Map out the connections / interdependencies between different teams in order to reach your goal and to breakdown silos. First of all, don’t stay in “your box” and wait for people to empower you to start the communication process between departments and even to external stakeholders. Once you get a feel for how to communication culture is playing out – be brave! Obviously, you need to adhere to the communication guidelines, but no matter where you sit in the company, you are the expert in your area, so don’t be shy! For instance think about the “partners/stakeholders” for your purpose? What role can they play to help your team achieve the goals? Sketch out a quick communication cluster model, like the example below: Once you go through this exercise you will soon find out that internal organisation charts become irrelevant when it comes to achieving real outcomes – again be brave to overcome silos! 3. Get your colleagues on board and build goal-oriented relationships! So this point goes beyond the classic “networking” this is about taking a systematic approach. Think about your goals and ask yourself: a) who do you need to work with inside your organisation and b) outside across the different industries to accomplish your goals? What can you bring to enrich the relationship with your stakeholders? For instance you could ty-out Working out loud by John Stepper. 4. Share and access ideas and knowledge across the organisation! This point goes beyond your company assigned “learning path”. It is clear we all need to be trained well to perform in our roles and we need to be knowledgeable about the does and don’ts in our industry. This point is about seeking people who will help you grow. Again, use your relationships and social platforms to find those people. You might prefer the classic mentorship programs that in most cases are set-up by the company – however again be brave and look for the “right” person or group yourself! Who inspires you and who would you would like to exchange your ideas with? Create an internal “lean-in group” or use other formats to grow. 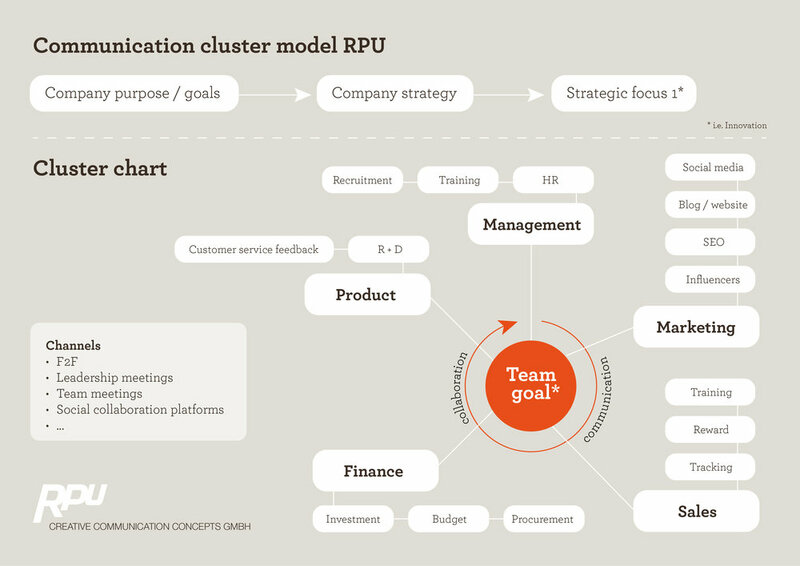 You will find bits from above in the “classic” communication plans, with the difference that in this cluster model, collaboration is the main focus to achieve your goal. Hope this blog inspires you to become braver in your ways of communicating and collaborating with each other. So you can start: Rockin’ all over the world…! I would be delighted if you took the time to leave a comment! Or let’s exchange on ways of communicating that are “different” from the classic approach and have helped you break down silos. Or obviously feel free to educate me on the band Status Quo!